I’m greatly enjoying the second collection of Michael Palin’s fastidiously kept diaries, published late last year under the title Halfway to Hollywood. Starting in 1980 just after the release of Monty Python’s The Life of Brian and wrapping up in 1988 as he’s preparing for the first of his televised circumnavigations, it’s both a gentle bit of time traveling and a generously candid account of the business of comedy in the Eighties. Even from within the eye of the Python creative storm Palin is remarkably astute about the quality of his many (and they are many) varied projects. Within the first few months we see comedy epic Time Bandits ready to start filming, the first seeds of what was to become Monty Python’s The Meaning of Life starting to sprout and the fascinating account of a train journey north, through England and into the far west of Scotland recording a series on railways for the BBC. Woke at four to the silence of the countryside. For a moment or two, lying there in the pre-dawn in the isolation of this tiny North Yorkshire village I was seized with a crisis of confidence. What I was doing seemed so unreal. I am not a documentary presenter; I have no special knowledge or authority to talk about railways or even a special skill in getting people to talk. I have been chosen mainly because of what I have done in the past, which has made me into a reasonably well-known TV figure, but more precisely I’ve been chosen because Ken senses in my personality something which the viewer will like and identify with. So there I am, lying listening to a cuckoo which has just started up in a nearby wood as the grey gives way to the gold creeping light of another hot day trying to bring into sharp and positive focus this ephemeral ‘personality’ of mine which is my chief qualification for this job. How I wish I were dealing in something more finite – like the skill of an engine driver or a cameraman. Something which you can see, feel, touch, switch on and off. But no, for an hour on national TV I am to be everyone’s friend – the traveller that millions are happy to travel with. It's quite sweet to see that the then 37-year-old Palin had no idea that being everyone's favourite tour guide was to be his career for the next twenty years. Even nicer is the stark contrast with many of today’s television stars – outwardly brash, flush with confidence; as if a place on our screens and in our homes is theirs by right. It's hard to imagine those two-bit celebrities given their own shows because they were on reality TV or are related to someone famous (yes, people like you, Antonia Kidman) questioning whether they merit their airtime. I also find Palin’s candour inspiring because, as advanced in career years as I am, I still haven’t identified any of those absolutes - something you can see, feel, touch – in my own work life. Apart from the fact that I've never set anywhere on fire or physically assaulted a colleague I've never quite understood the real reasons why I've remained reasonably gainfully employed over the years. If the man who brought us cross-dressing lumberjacks, redefined Spam for at least two generations and recast the Spanish Inquisition as inept torturers counting fear, surprise, ruthless efficiency, fanatical devotion to the Pope and nice red uniforms amongst their weaponry can still have self doubt about his skills then who am I to question the way the world works. Personally I find it quite nice that even a Python can admit to a crise de confiance because it shows no matter what line of work you're in there are good days and bad days and it's probably best not to fret. 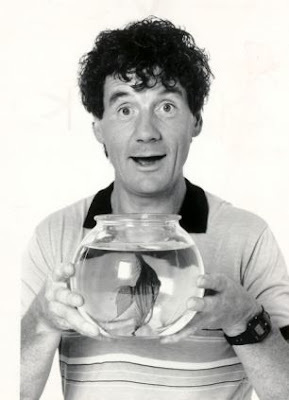 Ever the most publicly beneficent of the Pythons (it's hard to imagine Eric Idle or John Cleese campaigning for sustainable transport) Michael Palin remains one of the nicest people in showbiz. Find out more reasons why in Halfway to Hollywood, out now in a lovely shiny hardback through Weidenfeld & Nicolson. Have You Had Your Tea Dave?